When you walk past your windows, do you feel a breeze? When you open a window, does it have a life of its own and refuse to stay open? Do you have to give friends and family members special instructions for how to open or close your front door depending on the time of year? If so, then it’s probably time for some new windows and doors. 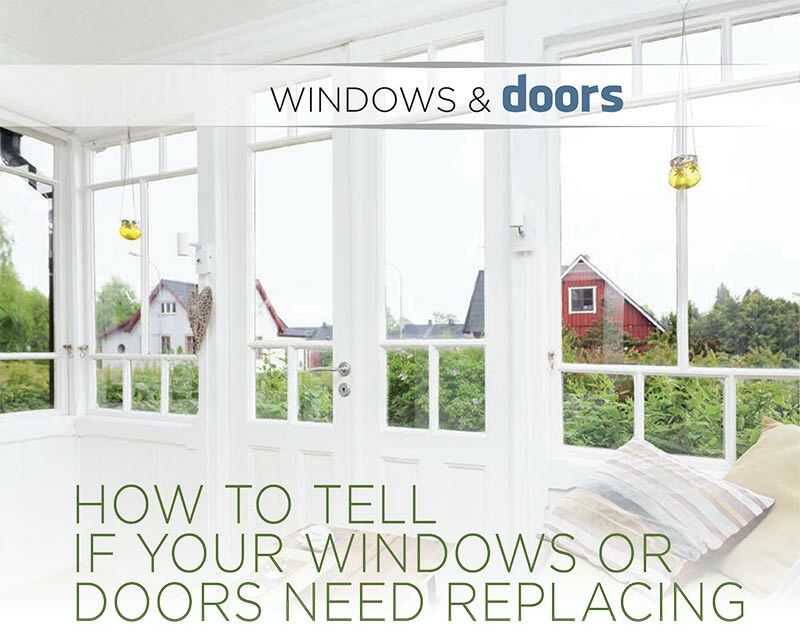 There are some basic telltale signs for window and door replacement and the energy-efficient options homeowners should consider. For windows, the signs for replacement or repair are: air infiltration, water infiltration, rotting or damaged frames and seal failures in existing glass. You may notice your double hung windows won’t lift or stay up, which can be caused by one or more broken balances. Another warning sign that your window needs to be replaced is if you see moisture in-between panes. Casement windows that don’t open or close properly can be caused by broken hardware or rotted wood in the sash or window frame. Rotted frames or exterior trim can create water infiltration. Deteriorating weather stripping may also cause air to leak into the home. Some of these problems, if small, can be repaired, but if the amount of problems is too great, then replacement becomes the best option. Even though repairs may be less expensive now, they are usually just a short-term fix for what may be a long-term problem. So how do you tell what kind of window to get? All window glass manufacturers today offer at a minimum, two layers of Low E glass and dual panes that are filled and with Argon gas. The window frame materials however, vary greatly.There are basically five core options for new window frames. They are vinyl, wood, aluminum clad, fiberglass and composite. Consulting with a knowledgeable, reputable window and door company who can explain the features and benefits of each is a must. Doors have many of the same issues of air infiltration, water infiltration and rotting or damaged frames. If your door is difficult to operate, sticking in the summer and not in the winter, or you need to push on it to lock it, or lift up, these are all signs that a replacement may be necessary. Sometimes a service call can help with the readjustment of your sill or door hinges, but often it is better to investigate a new energy efficient entry door. Doors are available in wood, fiberglass, and steel. Door manufacturers now offer fiberglass doors that mimic the look of wood, and offer Low E, energy efficient glass for both the door and sidelights. A new front entry door can completely transform the exterior of your home and add to the efficiency of your home. Adding a new entry door can also increase your home value. Your home has its own style and choosing a door and door glass that fits your needs, as well as your style has never been easier. Many door manufacturers have websites where you can see different styles, but we recommend finding a showroom that has a multitude of door styles and glass offerings.